TOPEKA, Kan. (AP) — Two moderate Republican legislators in Kansas became Democrats on Wednesday, capping an unprecedented round of GOP defections in the Kansas City suburbs that soured on President Donald Trump and a close political ally of his in this year’s race for governor. State Sen. Dinah Sykes and Rep. Stephanie Clayton joined two other moderate lawmakers who switched last week. All four women are from Johnson County, which is the state’s most populous county and which Democratic Gov.-elect Laura Kelly carried in the November election. Kelly defeated conservative Republican Kris Kobach, the Kansas secretary of state who trumpeted his endorsement by Trump. Kansas City-area voters also showed their displeasure with the president by electing Democrat Sharice Davids, a Native American and LGBT lawyer, to Congress, ousting Republican incumbent Kevin Yoder. Clayton said her decision to leave the GOP was prompted by concerns that its leaders are not committed to boosting public school funding. She also acknowledged that her constituents, particularly women, are upset with Trump and said her discomfort with his policies helped pushed her to leave the GOP. In Oklahoma, state Rep. Johnny Tadlock , who represents a rural district in the state’s southeast corner, switched to the Republican Party. In 2017, West Virginia Gov. Jim Justice also switched to the GOP in a state Trump won by nearly 42 percentage points. Kansas Democrats have had a few high-profile party switches over the past 20 years, most notably in 2006, when Mark Parkinson , a former state GOP chairman, ran as a Democrat for lieutenant governor. He became governor in 2009 when then-Democratic Gov. Kathleen Sebelius resigned to become U.S. health and human services secretary. But before last week, only five legislators had switched parties in the past 50 years, four of them Democrats who became Republicans. A sixth lawmaker, state Sen. John Doll , a moderate from western Kansas, left the GOP in March and became an independent for an unsuccessful run for lieutenant governor. According to the state library, there’s no record of four lawmakers switching parties in such a short span. Even so, Republicans will maintain supermajorities in both legislative chambers, slipping to 84-41 in the House and 28-11, with Doll as the one independent, in the Senate. Furthermore, the Legislature emerged from this year’s elections more conservative, with GOP moderates losing ground to conservatives. Republicans enjoy a 3-to-2 voter registration advantage in Johnson County, but GOP moderates have remained a political force. Kelly carried Johnson County by nearly 17 percentage points and Davids won there by almost six percentage points. Even Democratic candidates for attorney general and state treasurer who lost by a wide margin statewide narrowly carried Johnson County. 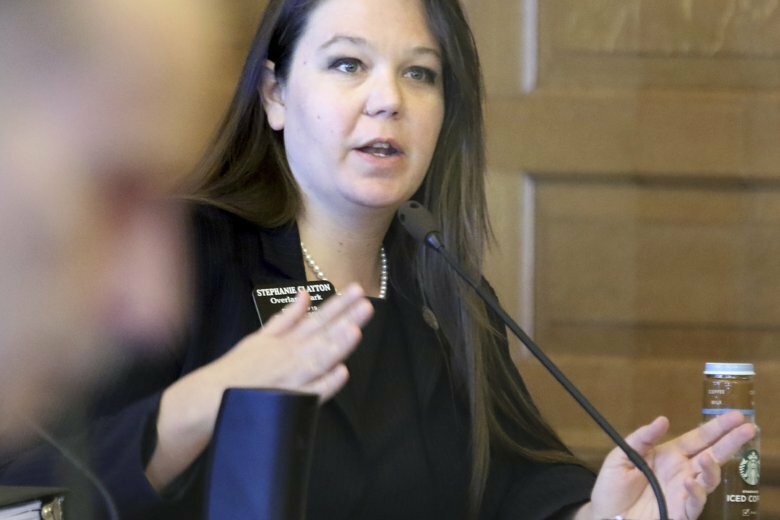 “If there was a blue wave in Kansas, it was in Johnson County,” said state Senate Minority Leader Anthony Hensley, a Topeka Democrat. Patrick Miller, a University of Kansas political scientist, saw the results in Johnson County and the party switches as part of an ongoing national political realignment. Sykes and Clayton joined state Sen. Barbara Bollier and state Rep. Joy Koesten , who switched parties last week. Clayton won re-election last month as a Republican, but Koesten lost her GOP primary and will leave office in January. Sykes and Bollier are in the middle of four-year terms and face voters again in 2020. Sykes defeated a conservative incumbent in the Republican primary in 2016 in winning her seat. Clayton was first elected to the House in 2010 and helped organize a bipartisan Women’s Caucus.